NEW Biorock Artificial Reef Presentation - July 26, 2013. Dr. Thomas J. Goreau of the Global Coral Reef Alliance and Stephen Attis of Vone Research gave a presentation about the Biorock artificial reef restoration project in the town of Lauderdale-By-The-Sea. The speakers discussed how the project's Biorock technology makes it the only artificial reef of its type in the U.S. and what was involved in building and installing the reef structure. NEW Biorock coral reef restoration in the Maldives on the BBC, Sept 6 2012. Dr. Goreau's response to the author. NEW GCRA to start Biorock coral reef restoration projects in Malaysia with the Malaysian Society for Nature, Elly Fazaniza, TheSundayDaily, Malaysia. Briefing for small island developing states delegates to the UN Conference on Sustainable Development, June 20-22 2012 on the impacts of climate change on small island developing states. GCRA's Balinese Sister Organization, Yayasan Karang Lestari (Pemuteran Bay Protected Coral Association) is awarded 2012 United Nations Development Program Equator Award for Community Based Development and special UNDP Award for Marine and Coastal Management at the United Nations Conference on Sustainable Development in Rio de Janeiro, Brazil, for coral reef and fisheries restoration projects in Pemuteran, Bali, Indonesia. June 20 2012. Awakening of the senses, Gili Trawangan is not just about having fun in the sun. Join Mallika Naguran as she dives deeper into this island’s underwater garden for a spot of coral reef restoration, Mallika Naguran, Foued Kaddachi, March/April, 2012. Oysters show significantly higher growth rate and survival on Biorock electrical structures. Thesis by Nikola Berger, 2009. Nature in the Sea: Island hopping in Lombok, by Bert Hoeksema (in Dutch). An article in a Dutch dive journal and it features Biorock at Lombok. 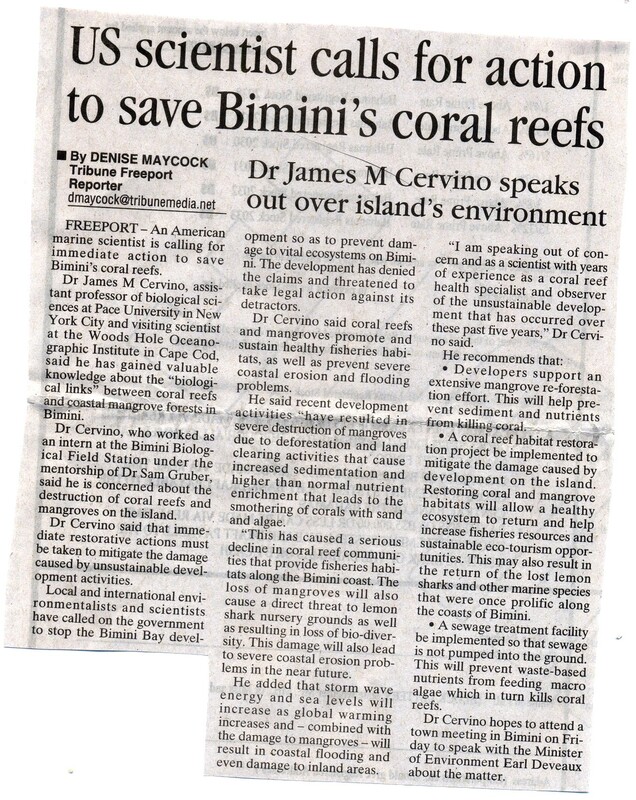 Bahamian environmental organizations call for monitoring of the impacts of golf course development on coral reefs, Troy Albury, President, Save Guana Cay Reef, 2.23.2012. 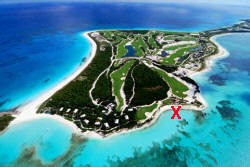 The red x marks the Baker's Bay site of the red and green algae bloom where the golf course green is near the shore. Videos show the MSC Poesia that grounded on a reef on Jan. 7th 2012 off Lucaya Beach, Grand Bahama. Scuba diver breaks world record in Lauderdale-by-the-Sea, South Florida Sun-Sentinel.com, Erika Pesantes, December 3, 2011, Story: Text. Biorock reef restoration in Pemuteran, Bali, Indonesia, filmed by Rani Morrow-Wuigk for the UN sponsored world wide TV program One Day On Earth in early 2012, featuring great projects from every country in the world. "This is a documentary about the Coral Reef Restoration Project in Pemuteran Bay, Bali, Indonesia, filmed on 11/11/2011. This Project started 11 years ago using Bio-Rock Technology. Biorock® reef restoration uses safe low voltage electrical currents to grow limestone structures of any size and shape in the sea. 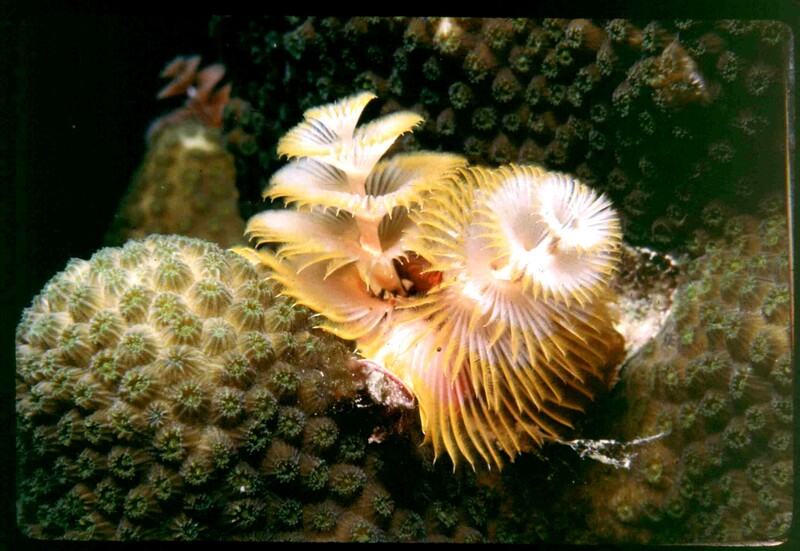 Corals, oysters, fishes, and other marine organisms are attracted to them and grow faster, have higher survival, and are much more resistant to environmental stresses such as very high temperatures. The Biorock process was invented by architect Wolf Hilbertz and developed by him and marine biologist Tom Goreau. The Karang Lestari project in Pemuteran is the largest coral reef restoration project in the world, and has been running since 2000." Artist Colleen Flanigan discusses Biorock Living Sea Sculptures at TEDxWoodsHole, 10/15/2011. Biorock® Corals Bleach Less, Recover Faster, and Have Higher Survival After Heat Shock: Biorock Ark Electrotherapy To Save Coral Reefs From Global Warming, Asia Pacific Coral Reef Symposium, Phuket, Thailand, Thomas J. Goreau, Global Coral Reef Alliance, Thomas Sarkisian, Biorock Thailand June 2010. Bali Reef Bombers, Photos depict the capture of poachers caught dynamiting Bali reefs in March of 2002. Can ‘electric oysters’ restore New York’s waters? Experiment aims to reestablish bivalves staggered by pollution, overharvesting, and disease. Moises Velasquez-Manoff| Staff Writer of The Christian Science Monitor/ October 9, 2008. 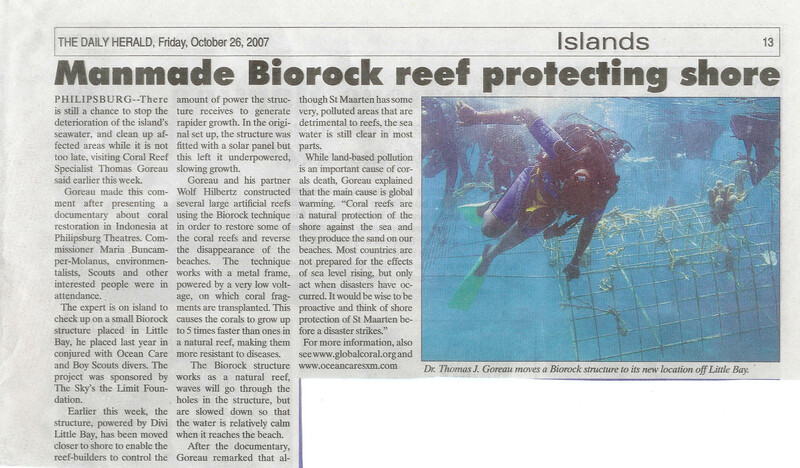 Electricity Revives Coral Reef, Wired Magazine, Associated Press, 08.22.04. New Source for Information on the Destruction and Rehabilitation of the World’s Coral Reefs, Press release on new GCRA web site. News video of Delray Beach, FL sewer outfall pipe. The NPDES permit for this outfall expired December 2005. Ocean-Grown Homes: Wolf Hibertz Wants To Build Low-Cost Housing From The Sea, Andy Turnbull, Popular Mechanics, September 1997. Paradise Restored, Reef Relief, Aston Martin Owners Club Annual Desk Diary 2008, 1st January 2008, Publisher, Faircount Media Group. Tom Goreau interviewed by OneClimate at the climate change conference that took place in Copenhagen Denmark in December 2009. 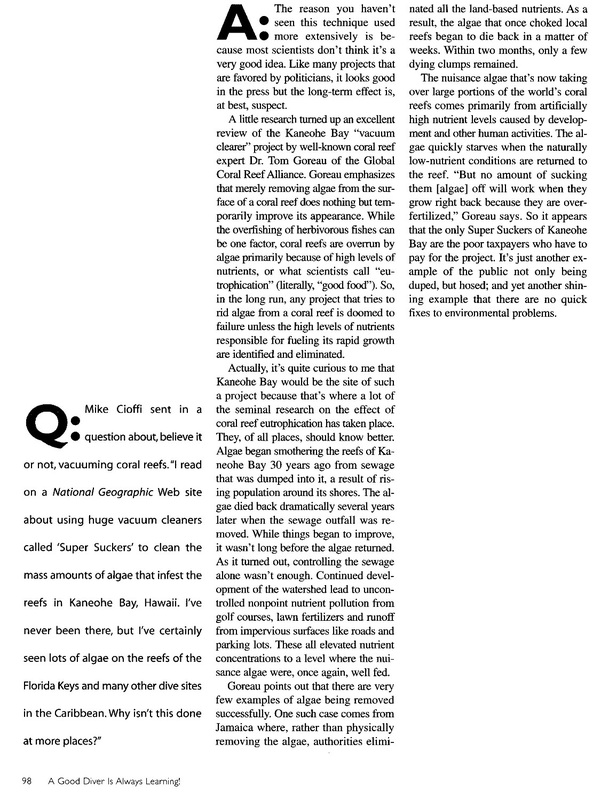 Tourism, Water Quality, and Coral Reef Health, Press Release, October 5, 2006.